There are many gyms to choose from when looking for a fitness home. 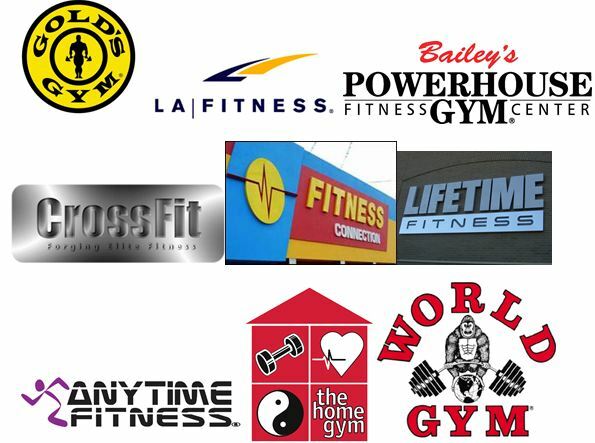 Fitness giants like; LA Fitness, Gold’s Gym, Bailey Powerhouse, and World’s Gym are just a few that dominate the market. People are now joining Crossfit gyms which I love, building home gyms and working out in the fitness clubhouse where they live. Most gyms offer a plethora of amenities like swimming pools, yoga classes, basketball courts, saunas, tanning beds, free weights and cardio machines. Ultimately when choosing your gym you pick the one where you will have the most benefit and of course the one that is closest to your home or work. What gym are you apart of and what do you like most about that gym? What keeps you there? What amenities or classes do you frequently take advantage of? I am currently not apart of any gym but have been in the past. I mainly do workouts at home, in the parks or run in the neighborhood. However when the weather starts to get colder I may be joining a gym again haha. What keeps me working out at home is the convenience of being able to just wake up and get a workout in and not worrying about how long it will take someone to finish using a machine. Next year (2013) I am planning to take a tour to some of the biggest and best gyms in the country and will also be going to some Crossfit gyms too. I will then write an article of each gym I visited and what I found best about it. I’m an outdoor person and prefer to trail run or cycle over being cramped up indoors. Gotta love the great outdoors! Especially for runners and cyclist!! I LOVE my gym! I was a member at the same club (XSport Fitness) when I lived in Chicago, and when I moved to the DC area, there was no question that I would join again (they have clubs in Chicago, DC and NY). They have everything you could possibly lead – I’m a group fitness instructor there as well, and I don’t think I’ve ever seen a club that offers so many classes – and so many different types of classes – as XSport does (we have something like 85 classes a week). Nice Sarah! I heard a lot of good things about Xsport. It’s definitely on my list of gyms to visits. What type of classes do you teach there? It’s a GREAT club. I teach Pilates, Piloxing and Spinning. Nice! Would love to try one of your classes. I like music and and extra motivation when I go to classes!! Crossfit Durham (NC) — I joined initially simply because paying a gym membership was that extra motivation I needed every morning to wake up, get out the door to do something. I still have immense respect for anyone adhering to a strict program with a home gym. Once I got started I fell in love with Crossfit programming because of the short intense varied workouts. Crossfit Durham impresses me because of the people. The coaches are fantastic. Learning the regulars’ strengths and weaknesses and pushing/guiding us accordingly. The community there is amazing as well. The first day I walked in folks welcomed me, introduced themselves and treated me like an equal. I try very hard to remember that and reciprocate every time I see a new face around the box. To your point about convenience, CFD is not the most convenient. I drive by at least two other fitness centers 4 mornings a week to train at their facility. They’re that good. I have family in Greensboro! I would love to try CFD. Seems like its worth a try especially since you drive out of your way to go there. What is your favorite Crossfit workout? I like burpees and row machine. I’m like your Jay – I normally work out at home and a lot at the park. I do gyms from time to time but honestly some of the best workouts you can get is outdoors – plyometrics in the park. You’re right Ryan! Park workouts are great. I like them because it makes me feel like a kid again lol. The more you have during workouts the better. Are you a personal trainer? I haven’t gone to a gym for maybe 10 years. I stopped going to save money. Before that, I’d gone to gyms my whole life. I found that I never missed the gym. Of course, I mostly did the cardio machines there, anyway. Since I stopped going, I now walk twice a week outside, I do a yoga DVD at home, I have a heavy bag set up in my garage, I have a power tower and a bench and free weights in my house, and on the weekend I ski or mountain bike depending on the season. I also do physical work volunteering at a goat rescue. Sometimes I wonder if I could benefit from personal training, but mostly I like the convenience of doing my own thing right at home. It works for me because I am naturally disciplined. Very nice. What kind of equipment so you have in your home gym? I joined a gym for a lot of reasons. I’m a runner and prefer to run outdoors, but I needed an alternative for when the weather was bad. I also sometimes have inflammation in my hip, and the elliptical offers a great low impact cardio alternative to running when that hip acts up. Mostly, though, I wanted weights. I own some small hand weights, but I wanted more variety… and something heavier 😉 One day we’ll have a home gym, hopefully! Yes! It’s good to have variety when running. I focused on nothing but running at one point and when I got back into weights my body was completely shocked. Cross training is key! I belong to Crossfit Bedford in NH and absolutely love it. I’ve belonged to several gyms over the years, and this one is the most convenient with amazing workouts and trainers. Nice! What’s your favorite Crossfit workout? Yes! The sauna does feel great in colder weather. A ton of good benefits too! How often do you lift at home? I lift 3 days a Week, and run on my off days. We got a bit of snow today. I really need it to lay off for another 2 weeks so I can finish my couch too 5 K program. I use primarily use P90X and Insanity. On rare occasion I miss the spin classes at the gym but then remember I don’t want to pay the monthly fee. With P90X and Insanity I bought the program one time and one time only. Having a full time job and 2 teens with a loaded schedule of their own it makes it hard to make it to the gym also. I’ve used Insanity. I particularly like the ab workouts. Does the trick every time! If you are ever in the Milwaukee area, I will show you around the clubs where I work (Wisconsin Athletic Club). We have 6 locations, and we are awesome! Would be awesome! Ill let you know when I’m up that way! I am a gym junkie. I’ve been a member of 24 hour fitness, Bally’s, Rhino Boxing and now Pure Fitness in Carlsbad. I have become the most fit from the classes here, the boxing, the triple threat classes ( combo of spin, gravity and plyos/abs). The equipment’s pretty good, too. You come to the classes and the difficulty level is high but you eventually work up to that level. Hmmmm the triple threat class sounds challenging! Would love to try it one day! It’s crazy how working out kind of takes over our lives! I go to Bailey’s Power House gym in Atlantic Beach, Fla., and I absolutely love that it feels like it’s tailored to weight lifters! They have the cardio equipment in another area of the gym which leaves more room for free weights and weight racks 🙂 BTW I love your site! I recieve four emails with the same comment. Perhaps there is an easy method you can remove me from that service?